Two tower techs belted up Monday night to rescue eaglets in distress after a neighbor contacted wildlife authorities stating that one of them appeared to be injured. Ricky Blanco and Steve Barefoot, employees of USA Structural, formerly Goff Communications, said they welcomed the opportunity to assist in the rescue. 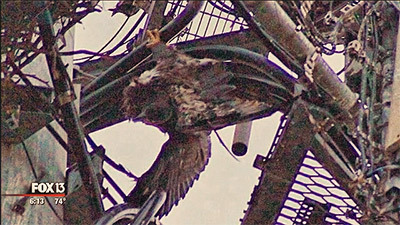 One eaglet was hanging upside down from the tower off of Cortez Rd. and 66th St. in Bradenton, Fla., its claw caught in what appeared to be a hanger clamp. With the eaglets’ mother and father circling above – clearly concerned for their babies – the techs were able to free the trapped bird. The second eaglet, still too young to fly, got frightened and tried to fly off, but crash landed about a half a mile away, according to Fox13. It did not suffer any serious injuries, but its sibling has a broken bone and cuts from being stuck on the tower.